Clearwater Marine Aquarium Dolphin tickets honor Winter. Whether or not your family saw the heart-warming movie “Dolphin Tale,” we know they are eagerly awaiting the release of “Dolpin Tale 2” this fall. Along with many of the same cast as the first, it stars Winter the Dolphin and tells the true story of her accident, rescue and rehabilitation by the Clearwater Marine Aquarium (CMA) in Florida. A continuing inspiration to everyone who meets her, especially children and adults with disabilities, Winter has become a national hero and her home has become a big tourist attraction. More a marine hospital than an traditional aquarium, CMA’s mission is to save injured sea animals, and nurse them back to health, release them (if possible) or provide a life-long home for them. While Winter is their most famous resident, local mom Kelly Stilwell shares five more great reasons to visit the Clearwater Marine Aquarium. Besides the CMA, Clearwater is home to some of the most beautiful beaches on the Gulf Coast. This season, several of Clearwater’s best hotels and resorts, official partners with the CMA, have joined with the facility to help bring your family to visit her by offering discounted rates, tickets to the aquarium and other features. Additionally, a portion of most of these packages is donated to the Clearwater Marine Aquarium to help feed and care for Winter and her friends, and to maintain her home. Sea Captain Resort on the Bay is located on the bay of Clearwater Beach and is currently offering two special deals to celebrate the release of “Dolphin Tale.” Choose a 2-night stay and receive a 2 pack PASS to the Clearwater Marine Aquarium, or a 4-nights stay and a 4 pack PASS to the Clearwater Marine Aquarium. For more details, rates and bookings, call 800/444-7488 or visit Sea Captain Resort. Hyatt Regency Clearwater Beach Resort and Spa is located between the turquoise blue waters of the Gulf of Mexico and the Intracoastal Waterway, minutes from the CMA. Their family-friendly “Dolphin Tale” Package, available for the rest of the year, includes accommodations in any room category of your choice (all include a fully equipped kitchen, outdoor balcony and water view), 4 tickets to the Clearwater Marine Aquarium, a copy of the book “Winter’s Tale” and a Winter” plush doll. For more details, rates and bookings, visit Clearwater Beach Hyatt. Two other local hotels have specials that are not specifically focused on the CMA, but they are good value for families wanting to stay in the area. Sheraton Sand Key, a beach resort on Clearwater Beach, offers 390 rooms and suites overlooking the Gulf of Mexico and the Intracoastal Waterway and resort amenities abound. Their “Breakfast Savings” package, valid indefinitely, includes 35% off all weeknight stays and complimentary breakfast for two if you enroll in their free SPG loyalty program. For more details, rates and bookings, call 866/716-8127 and mention Code SPG35B or visit Sheraton Sand Key Resort. Hilton Clearwater BeachResort is the closest hotel to Winter’s home. Situated on 10 acres of sugar white sand, it is in the heart of Clearwater Beach. Their special “Family Fun” package, valid through May 16, 2015, includes overnight accommodations in a contemporary and comfortable guest room, free WiFi and breakfast for all. 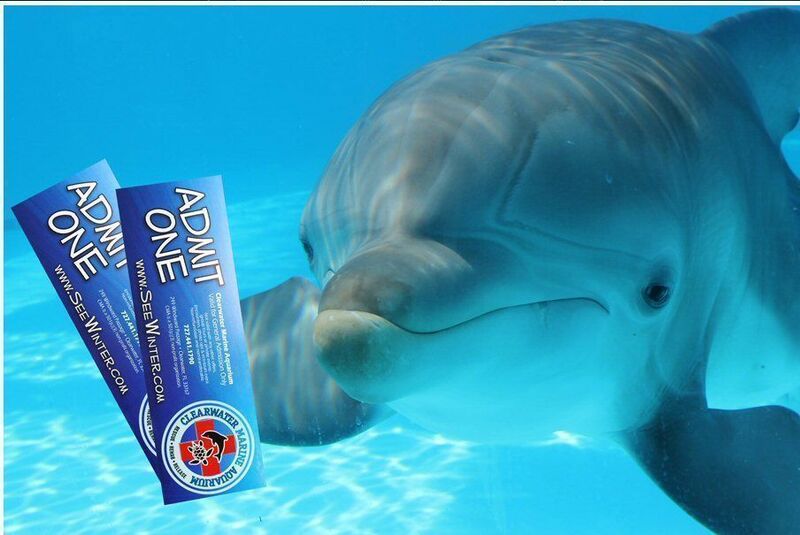 Their concierge can help you get tickets to the Clearwater Marine Aquarium. For more details, rates and bookings, visit Clearwater Beach Resort.